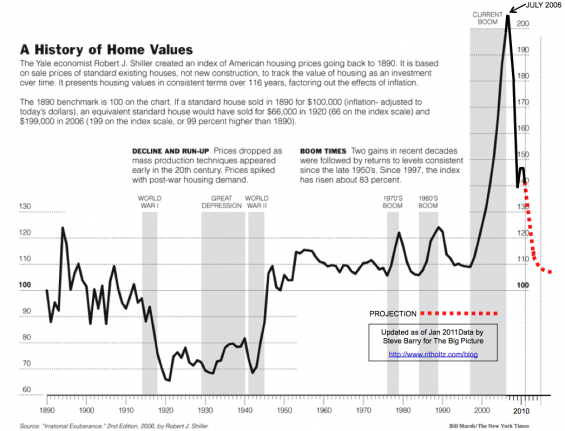 The famous Case-Shiller home price graph that shows the history of home prices. We are currently witnessing the greatest decline in home prices since the Great Depression. The worst jobs president since the Great Depression is overseeing the worst housing downturn since the Great Depression and the worst slide in home prices since the Great Depression. The latest Case-Shiller house price index was just one of a slew of disappointing economic data from the US yesterday, which suggested ebbing confidence in the recovery of the world’s largest economy. The Chicago PMI manufacturing index showed a sharp slowdown in the pace of expansion in May, missing Wall Street forecasts and sending the index to its lowest since November 2009. And in the latest Conference Board consumer confidence survey more people expressed uncertainty over their future economic prospects. The confidence index fell unexpectedly to 60.8 from a revised 66.0, when economists had expected it to rise to 67.0. Falling house prices and negative equity combined with high petrol and food prices and a still-weak jobs market to raise consumers’ fears for the future.